A day late, again... sorry! It's been such a busy few days, spending lots of time with family and STILL recovering from being sick. I hope you all had a great Christmas and are gearing up for a fun New Years Eve. 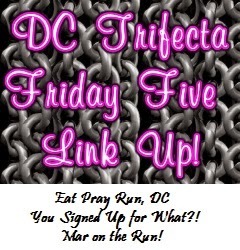 I'm linking up with the DC Trifecta: Courtney at Eat Pray Run DC, Cynthia at You Signed up for What?, and Mar at Mar on the Run, as I do every Friday. Thanks for hosting, ladies! This week's theme is "Free Friday", which means we can write about whatever we want. It was a tough call, but I decided to list my favorite races of 2014 (quite hard to narrow it down to just five! ), as my final Friday Five post of the year. It's going to be a short post, as I'm sure everyone is busy this time of year. Top Five Races of 2014 (though not in a particular order). 1. Tinker Bell Half Marathon. My first time to Disneyland, and so of course was also my first runDisney race there as well. 3. Rock 'n' Roll Remix Challenge. I'm just going to lump this race weekend together as I did the 5k and half. I met Shalane Flanagan after the 5k, which was such an exciting moment, and had a really fun time at the half (even though it was crazy hot). 4. Rudolph Ramble 8k. Just a really fun, holiday themed race that was well organized and had a nice course. 5. Soldier Field 10 Mile. Another well organized race, with a finish line on the 50 yard line of Soldier Field – really cool. Some other races that I really enjoyed: Rock the Night 5k, Burgers and Beer 5k, Shamrock Shuffle, Chicago Spring Half Marathon, and the Magnificent Mile Women's Half Marathon. Did you have any favorite races from this past year? What made them so special? This was my topic for Friday Five too! I hope to do Tinkerbell one day! My favorite this year was Revel Rockies. Such a cute graphic!! I've noticed RnR adding more challenges to their city tours - I may do the 5K in DC this spring. Thanks! I'd love to do 2 cities (or more) some year - it's great that they give out extra medals for that, too.